Ken Layaou, one of our outstanding volunteers, is collecting information on the history of bands in Wyoming County. It’s his intent to compile a book (or even a series of books) for the historical society. 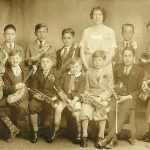 Please let us know if you, a loved one, or an ancestor was active in a band any time in our history, and thank you! Your personal and contact information will be confidential. Who were your musical inspirations?